Progesterone is a naturally occurring female hormone that decreases as women age—especially after menopause. Oral progesterone preparations are used to treat irregular menstrual periods in women who have not yet reached menopausal age. It is also used to treat and prevent overgrowth in the uterine lining of postmenopausal women, especially those on estrogen hormone replacement therapy. Progesterone is typically prescribed in order to replace or correct the hormone in women who do not make enough of it. It is very effective at doing so and brings relieve to tens of thousands of women around the world. It helps treat amenorrhea or the unusual cessation of normal menstrual periods in women who are not pregnant. Progesterone is also commonly used together with estrogen hormone replacement therapy to manage symptoms of menopause (such as hot flashes). In addition, combination estrogen and progesterone replacement therapy is used to prevent endometrial hyperplasia (thickening of lining of the uterus due to estrogen) and reduce the risk of uterine cancer. It also treats problems with menstruation such as unusual or heavy bleeding. Progesterone also helps prevent endometriosis and provides relief for its symptoms (such as pain). Progesterone should not be given to children as well as to test for pregnancy, although it may be used to maintain pregnancy in women who lacks progesterone. Aside from the FDA approved indications for progesterone, it is sometimes used “off-label” for other medical conditions that include: prostate cancer, insufficient corpus luteum, hot flashes, precocious puberty, and polycystic ovary syndrome. It may also be prescribed by your healthcare provider for other medical purposes not discussed in this guide. Oral progesterone preparations augment the body’s normal progesterone levels. It stimulates and regulates various bodily functions that include preparing women for childbearing, regulating monthly menstrual cycle and maintaining pregnancy. It is also stimulates the growth of breast tissue during fertilization which facilitates lactation. Progesterone also plays a role in sexual desire. Progesterone comes in different drug formulations and doses. Read your prescription label carefully and take medication exactly as prescribed for you. If you do not understand the prescription or have any questions, ask your healthcare provider or pharmacist. Take every dose around the same time of the day to reduce possible side effects and to maximize its effect. Progesterone is sometimes prescribed only for a short duration, usually 6 to 12 days during each menstrual cycle. Follow the dosing instructions carefully for the drug to be effective. Avoid missing doses. If taking the pill form of progesterone, take it with a full glass of water. If using the progesterone cream, apply it to the part of the skin as directed by your healthcare provider. 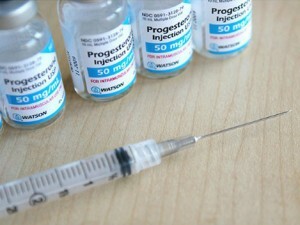 Progesterone injections should be given by a trained healthcare practitioner, such as your nurse or doctor. Your healthcare provider may also give you instructions on how to use injections at home. Do not use this medicine at home if you do not understand the safe and proper way of administering progesterone injections. Progesterone is often taken along with certain medications. If taking combination drugs, make sure that you take each medicine at the recommended time and do not combine them. Ask for specific instructions from your healthcare provider. Regular physician visits are necessary while taking this drug. Avoid missing any scheduled appointments. Progesterone could cause harm on the unborn child, as such should not be taken during pregnancy. Inform your healthcare provider if you get pregnant during treatment. Your healthcare provider may recommend an effective form of birth control while on treatment. Tell your doctor if you have allergy to peanut or other substances, some forms of progesterone contain peanut oil. Progesterone may affect the results of certain laboratory tests. Inform your doctor about use of this medication. Progesterone may increase the risk of certain diseases such as blood clots, heart attack, stroke, and breast cancer. If you have history of such diseases or diagnosed as at high-risk, inform your healthcare provider. Progesterone may affect your concentration and reaction. Caution should be taken if you drive or engage in activities that require attention.